The last home game for Norwich City this season was the visit of Reading FC which would be a crucial game for the Canaries as they fight to avoid relegation from the Championship. 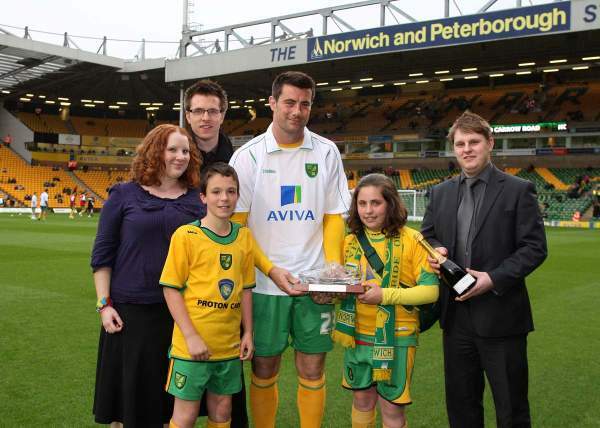 Prior to the crunch encouter the staff from Anglian Home Improvements presented Alan Lee with the player of the month award for April. TWO goals from Reading’s Shane Long in a second half controlled by the visitors kept alive their hopes of automatic promotion and put Norwich in deeper danger of the drop. Long headed The Royals in front on 68 minutes after good work and cross from Jimmy Kebe and then doubled their lead just 10 minutes later with another header, which knocked the stuffing out of the Canaries. The home side had had good spells of possession during the first half but could not capitalise on their pressure and in the end Long’s brace was enough to secure Steve Coppell’s side the victory. A lively crowd of City fans were in full voice as Reading kicked off the first half of this vital game and City had an opportunity just nine minutes in when Darel Russell had the first shot of the game – Jon Otsemobor’s cross was cleared to the edge of the area to the central midfielder, only for his low shot to be confidently scooped into the arms of Royals’ ‘keeper Marcus Hahnemann. Although Norwich had the majority of the possession of the first 20 minutes, they were unable to find their way through a resolute Reading defence. In his first start for the Canaries, Cody McDonald made a good break in the 21st minute – but his forceful run was cut short by a challenge from Reading’s Liam Rosenior, just as the young City striker looked to burst into the Royals’ box. Midfielder Sammy Clingan’s resulting free-kick then just scraped the wrong side of the upright. On 31 minutes, City had a good passing move when Otsemobor broke down the right and found Alan Lee in the box. The frontman steered the ball across the goal and his off-balance strike-partner McDonald attempted an overhead kick but it was a comfortable claim for the Reading stopper. Just a moment later, David Carney had a great effort from 30 yards, but unfortunately it flew just over Hahnemann’s bar. As the first half came to an end, the Canaries continued to apply the pressure with good bursts from McDonald and Gow but unfortunately couldn’t find that final ball. Clingan then had a volleyed effort from 25 yards but the ball flashed just wide of the Royals’ right-hand post. The Canaries started the second half with a left-footed curling effort from Alan Gow which dropped just over the angle. This was followed a moment later by Clingan releasing the ball down the left and finding a pacy McDonald, but the 22-year-old was adjudged to have clipped the heels of Andre Bikey to the disgust of the Canary faithful. Reading were proving more dangerous on the break – Irish international Shane Long breaking down the right and sailing an effort just over the City bar.But this was just a warning and Reading did take the lead after 68 minutes. A Jimmy Kebe cross from the left fell to an unmarked Long at the far post, who made no mistake heading home from close range. Exactly ten minutes after the first, another devastating blow came for Bryan Gunn’s side – the Royals doubled their lead when another cross from Kebe found Long, who headed past the diving Marshall. Reading continued to control the game as it approached the final whistle, with the home side rarely testing the skills of Hahnemann in this closing half. Despite the four minutes of time, Steve Coppell’s side ensured the score remained at 2-0.